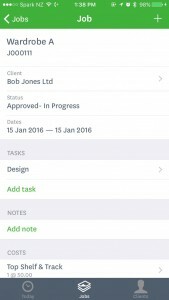 Have you been waiting for a better mobile app for WorkflowMax? The wait is over – you can now download the WorkflowMax app for free from the apple store. You can now access more information about the job, straight from the WorkflowMax app. 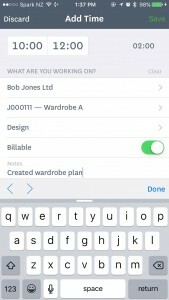 You can view milestones, view and add tasks and add task to dos. You can view more client information, such as client address, contacts and contact details. You can press phone numbers to call, email and link to clients websites. The app works in a similar way to the timer in the new user interface in WorkflowMax. You can enter the start and end time or time duration as per your company settings, or you can now also use the start/stop feature. Time can now be edited and discarded within the app. You can add cost items, but the app does’t search the cost items table, so added costs may need to be edited later in the browser version. If you are entering costs on the fly like this, it will not pull the correct accounting coding. Contact us if you need assistance with GL coding from WorkflowMax to your accounting software. You can view existing job documents, but you currently aren’t able to add them via the app. If you have Box, Dropbox or Drive enabled within WorkflowMax, you may be able to add documents via their apps. Contact us if you would like to discuss document add-ons for your business. Unfortunately, you can’t view custom fields on the app, so if you have site address for your mobile staff, you would be best add this in the notes tab. There is no android app at this stage. However, you can access the mobile site via your phone, enter http://www.workflowmax.com/ into your browser. You can save this as shortcut on your phone, so it appears like an app. How to determine which WorkflowMax user interface you are on: or the new: f you have an option called Dashboard on your green banner, you are on the new user interface. If you have the option called MyMax, you are on the older user interface. Call us if you want to discuss if you should upgrade. When using mobile devices, if you would prefer to access the full browser version, rather than the mobile site, enter https://my.workflowmax.com into your browser.